WILL Oscar Diggs (James Franco) – the man who would become Wizard, the man who helped Dorothy and her friends find what they were ISO – discover who is good and who is evil amongst the witches (Mila Kunis, Rachel Weisz, Michelle Williams) that he encounters en route to a certain faraway land? Will this son of Kansas fall victim to the myriad temptations set before him? If Oscar fails, all is lost for the Land of Oz and maybe even the world as he knows it. Future visitors such as Dorothy&Co. will be stranded in a strange, dystopian society. 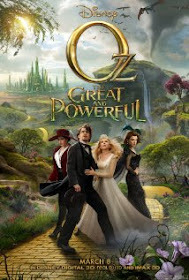 "Oz The Great and Powerful" imagines how Oscar was taken from the heartland to become The Great One. The film opens today in the United States and the United Kingdom. (See trailer above).